Since Heart for Aids in Kenya began almost ten years ago, we at Wheaton Bible Church have learned an incredible amount about the value of bringing the whole congregation around a global initiative and how to build staying power that will result in long-term impact. A key element of Heart for Aids—recently expanded and rebranded as HOPE [KENYA]—was the decision to partner with nationals to multiply the impact of available resources. Early on, WBC missionaries Scott and Barb Harbert established a long-term partnership with Josephine Kiarii, helping her launch the Hope for Life Center in Nakuru, Kenya. The same commitment is apparent as we expand our ministry footprint to Turkana, this time partnering with Nairobi’s Parklands Baptist Church and the all-African staff of World Relief Kenya. As we have already seen, the relationships built on both personal and organizational levels can be life changing. There is so much to learn from one another as fellow believers coming from different cultures. Our expanded HOPE [KENYA] initiative has deepened our conviction of the value of holistic ministry. While most of us have no idea personally what it means to be really hungry or thirsty, we have sensed through our work in Turkana what a powerful thing it is to be able to provide relief to immediate physical needs. We see the kinds of results that motivate us to want to do more! The evangelical church has been criticized over the years for being interested only in the spiritual needs of the lost. While that is the most profound need for all of us, there is so much the church can do practically and tangibly in situations like Turkana’s to earn the right to speak into the spiritual needs of those who don’t yet know Christ. As we partner with God’s servants in Kenya, may He multiply the impact to bring healing transformation—physically and spiritually—to the communities of Nakuru and Turkana and, in time, to other regions of the world we haven’t even considered yet! Several years ago—when our church was leaving downtown Wheaton and getting ready to move to West Chicago—God was nudging us to become more externally focused. We began to think about ways we could serve outside the walls of the church building, especially since we were moving into a community that really didn’t know us. The result? God gave us a vision for a new ministry initiative in West Chicago. In 2008, the dream became a reality: Wheaton Bible Church and Iglesia del Pueblo embarked on a three-year pilot program for a ministry called Puente del Pueblo. It would be based in the Timber Lake apartment complex, just down the road from our new campus. God was nudging us to become more externally focused. Puente del Pueblo literally means “Bridge of the People,” and it reflects our vision of people reaching out to people in the community. In partnership with Outreach Community Ministries, this initiative aims to serve Timber Lake residents and to build a strong sense of community by assisting people in making changes that benefit their personal and family lives. The Timber Lake complex has been fertile soil for developing followers of Christ! Today there is a weekly community Bible study with sixty attending regularly. More than a dozen residents have been baptized, and a growing number are attending our Hispanic worship services or other ministries. Pray that God will continue to use Puente del Pueblo to more fully engage our church in local ministry. Building on Puente’s impact of the past three years, we are eager to see what else God has for us in West Chicago as community leaders plead for us to expand these programs to more apartment complexes and other parts of their city. While we continue our commitment to being a sending church, a developing vision this coming year is to enlarge opportunities for our church members to engage in cross-cultural ministry among the nations God has brought to DuPage County. That includes encouraging individuals and families (especially young couples and singles) to move into housing complexes with high percentages of immigrants and refugees—as well as being purposeful in welcoming and engaging with neighbors of other nationalities now living in our neighborhoods. The LORD your God is God of gods and Lord of lords, the great God, mighty and awesome, who shows no partiality and accepts no bribes. He . . . loves the foreigner residing among you, giving them food and clothing. And you are to love those who are foreigners, for you yourselves were foreigners in Egypt. Fear the LORD your God and serve him. This enriched focus will eventually include a training curriculum, personal mentoring, and structured practical experience for those desiring to become more effective in cross-cultural ministry or to prepare for global service. The two most recent career missionary couples sent out in the past year by WBC lived in ethnically diverse apartment complexes prior to moving to another region of the world. This experience provided an opportunity for them to learn cross-culturally and to forge rich relationships with immigrants right here in our community. Both couples agree that this was invaluable experience—whether they had chosen to remain living in the area or, as in their case, as preparation for their relocation toremote parts of Asia. 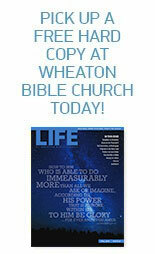 Since its founding, Wheaton Bible Church has been a sending church. WBC currently has 93 missionary couples or singles serving on six continents. Some, like Randy and Nancy Capp, who have returned to tumultuous Egypt, serve in dangerous areas. George Janvier, who has trained evangelists, pastors, and theologians in Nigeria for 27 years, serves in a hot spot of violence against the church. Others, such as Kevin and Rahela Conway, are equipping national leaders from Europe to Central Asia; Greg and Faith Hurst are multiplying disciples and churches in Latin America. Our newest appointees, Chris and Dana H., were commissioned in October and arrived in November in a region in southern Asia where the population is largely Hindu. As we head into a new year, we continue to seek, train, send, and support members of WBC who are called of God to invest their lives in His global mission of reconciling people to Himself. Our Missionary Preparation Program (MPP) mentors and Missions Personnel Team have added members to expand WBC’s capacity to prepare and care for effective global servants. Our newly formed Missionary Welcome Team, led by Dan Bostrom, is ministering to WBC missionaries furloughing locally so that they can return to the field healthy. The challenge is before us to grow the next generation of international servants from within our church. May you join us in fostering the value that fulfilling Christ’s great and global commission is the highest of callings. This entry was posted on December 1, 2012 by Wheaton Bible Church in Missionaries, Winter 2012/2013 and tagged global initiatives, global misssions, global outreach, HOPE kenya.